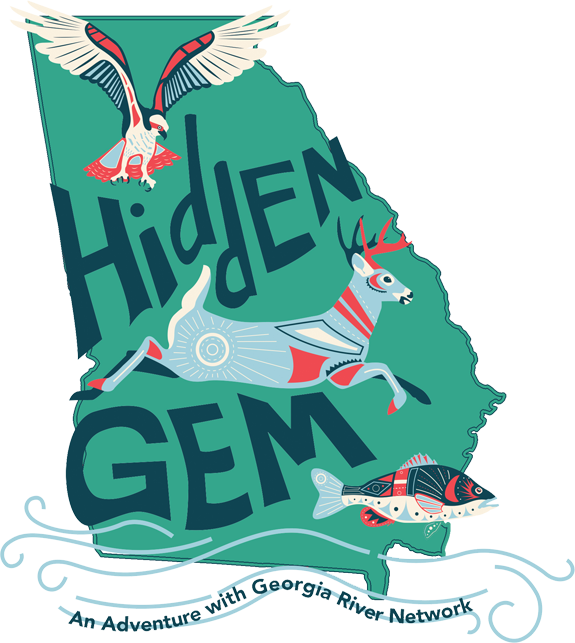 The Oconee River’s headwaters are located in Hall County. The Middle Oconee and North Oconee flow 55-65 miles before joining below Athens to form the Oconee River. The Oconee River then flows freely for about 20 miles until it joins the northern end of Lake Oconee, which is formed by Wallace Dam. Lake Sinclair is below Wallace Dam and is formed by Sinclair Dam. The Oconee River below Sinclair Dam flows freely, with the exception of one abandoned diversion dam near Milledgeville, for about 143 miles to its confluence with the Ocmulgee to form the Altamaha River. The Oconee River Basin drains a total of 5,330 square miles. The Upper Oconee contains 10,973 acres of lakes. The Oconee River Basin supports a diverse and rich mix of terrestrial and aquatic habitats and is home to a number of federally and state-protected species. The Altamaha Shiner and two invertebrates – Altamaha Arcmussel and Oconee Burrowing Crayfish – are state-listed as threatened species. The Robust Redhorse is state-listed as an endangered species. The Oconee River Basin provides drinking water for about 281,614 people in the state of Georgia by municipal or privately owned public water systems. The Oconee River provides drinking water through 14 surface water intakes: North Oconee River, Sandy Creek, Middle Oconee River (2), Curry Creek, Barber Creek, Bear Creek, Apalachee River, Oconee River/ Lake Oconee, Hard Labor Creek, Jacks Creek, Mulberry River, Cedar Creek (Barrow Co.), and Masseys Lake. The City of Athens is the largest municipal user of surface water in the basin, with two surface water withdrawal permits that total 28 million gallons per day (MGD) on a monthly average. Industrial surface water use is dominated by the largely non-consumptive use of water by hydropower generation facilities. NPDES Discharges: As of 2018, there are approximately 162 facilities, including industries and municipalities, authorized to discharge wastewater into the Oconee River Basin pursuant to NPDES permits. Natural Resources Conservation Service (NRCS) data indicate that, in 1995, the Oconee River Basin contained approximately 19,700 acres of irrigated farmland, which were responsible for approximately 4,000 million gallons per year (MGY) of water demand. Animal operations in the basin include approximately 158,000 cattle, 61,000 hogs, and 140,000,000 chickens, which together accounted for about 3,800 MGY of water demand. Total agricultural water demand (surface water and ground water) in the Oconee River Basin in 1995 was therefore approximately 7,800 MGY (21 MGD on average). As of 2018, the EPD had issued 592 agricultural water withdrawal permits in the Oconee River Basin. Georgia Power Company recently retired the fossil-fueled (coal) Plant Branch, which previously withdrew water from the Lake Sinclair. The Upper Oconee contains 5,467 small impoundments which cover 175 square km in the entire watershed. The Oconee River Basin contains three major surface water reservoirs: Bear Creek Reservoir, Lake Oconee and Lake Sinclair. Lake Oconee, formed by Wallace Dam, and Lake Sinclair, formed by Sinclair Dam, are Georgia Power Company facilities designed and operated for the production of hydroelectric power. Bear Creek Reservoir is operated by the Upper Oconee Basin Water Authority, and provides drinking water for Barrow, Clarke, Jackson and Oconee counties. A fourth reservoir is under construction: Hard Labor Creek Regional Reservoir is a joint drinking water project between Walton and Oconee counties. Fort Yargo State Park: This historic park features one of four log forts, or blockhouses, built in 1792 by settlers for protection against Creek and Cherokee Indians. Located between Atlanta and Athens, Fort Yargo offers a unique camping and fishing experience for families. Within the park is Will-A-Way Recreation Area, a facility specifically designed for special populations, with cottages, a group camp, food service facilities and picnic and fishing area. Hard Labor Creek State Park: An 18-hole public golf course is one of the attractions of this park near the antebellum town of Madison in central Georgia. Fishing & hunting: Throughout the Coastal Plain and in the Oconee National Forest area of the Piedmont, the Oconee River Basin is popular with fishermen and hunters of turkey, deer, hogs and waterfowl. Birdwatching: Hotspots include the State Botanical Garden of Georgia on the Middle Oconee River in Athens, Dyar’s Pasture Waterfowl Area in the backwaters of Lake Oconee, and Beaverdam Wildlife Management Area in Laurens County north of Dublin. Paddling: Paddling outfitters serve the Oconee River Basin in Athens, Milledgeville and the “Forks” area where the Oconee and Ocmulgee rivers form the Altamaha River. In the Oconee River Basin, there are approximately 108 rivers and streams listed on the 2012 integrated 305(b)/303(d) list as waters not supporting their designated uses. These impaired waters include roughly 786 miles of the Oconee River Basin.